When it comes to vertical vs horizontal blinds, there are several differences that could influence your purchasing decision. The key differences that you should know before you buy include construction, window size, how they affect a room’s lighting, ease of cleaning, and impact on energy efficiency. 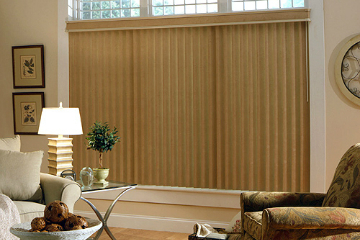 Vertical blinds are made of wide, overlapping panels that hang down from a wheeled, sliding track. Vertical blinds can be pulled open from either one side to the other or from the middle out like curtains, depending on the model. A rod or chain can be twisted to swivel the panels for controlling light and visibility. Horizontal blinds are made of thin, slightly overlapping panels that hang down from a static track. Horizontal blinds can be raised or lowered with a cord. Typically, a rod can be twisted to swivel the panels for controlling light and visibility. Generally speaking, vertical blinds are better for covering larger windows because gravity has a greater effect on horizontal blinds. While Vertical panels hang straight down, horizontal panels can bow toward the middle under their own weight if they’re too long. Your blinds specialist can help you determine the best blind for your window size. When it comes to room lighting, horizontal blinds have one advantage: they allow you to bounce light off the ceiling. Since you can angle horizontal blinds up, light can be made to reflect off the angled panels and then off the ceiling, which can help illuminate a room with soft, diffuse lighting from above. You can angle vertical blinds to bounce light off a wall, if you have a blank wall available, but that means light will be coming at you from the side, rather than above, which can be aesthetically displeasing and less effective for activities like reading. Horizontal blinds may have the upper hand for neat ways to light a room, but vertical blinds might make up for it with slightly easier cleaning. Once again, gravity plays a role. Dust, one of the most pesky obstacles to clean blinds, floats around a room and is eventually pulled down by gravity. As you can imagine, horizontal blinds become really effective dust catchers, as the dust simply settles along the entire length of a panel. Vertical blinds, while certainly not immune to dust, allow less to collect since dust relies on things like static electricity to cling, rather than a flat surface to settle on. …when completely closed and lowered on a sunny window, highly reflective blinds can reduce heat gain by around 45%. They can also be adjusted to block and reflect direct sunlight onto a light-colored ceiling. A light-colored ceiling will diffuse the light without much heat or glare. For more information about blinds for residential or commercial use, please call a window covering expert at Houston Blinds for Less at (281) 997-2100 or visit www.houstonblindsforless.com.